I was sitting in a tiny wooden rowboat in a shallow, swampy section of the Amazon River near Manaus, Brazil, holding a fishing rod made from a stick. On the end of the line was a chunk of chicken skin, dangling below the surface of the water. Our Brazilian guide was chatting with the other four guests on the boat, but I was staring intently at the water. I wanted to pay attention – I was trying to catch and eat something that would eat me back if given the chance. A tug on the line. I panic and stand up, causing the boat to rock alarmingly. I pull the piranha out of the water with a jerk and it flies into the bottom of the boat. Its gills are flapping and its mouth is opening and closing, showing off its razor sharp set of teeth. I’m freaking out at this moment – terrified of the carnivorous fish that is thrashing around uncontrollably. Our guide quickly grabs it in the right spot, so that he can hold it without being bitten. He lets us get a good look at its nightmare-inducing set of chompers before deftly hitting it over the head and gutting it right in the boat. 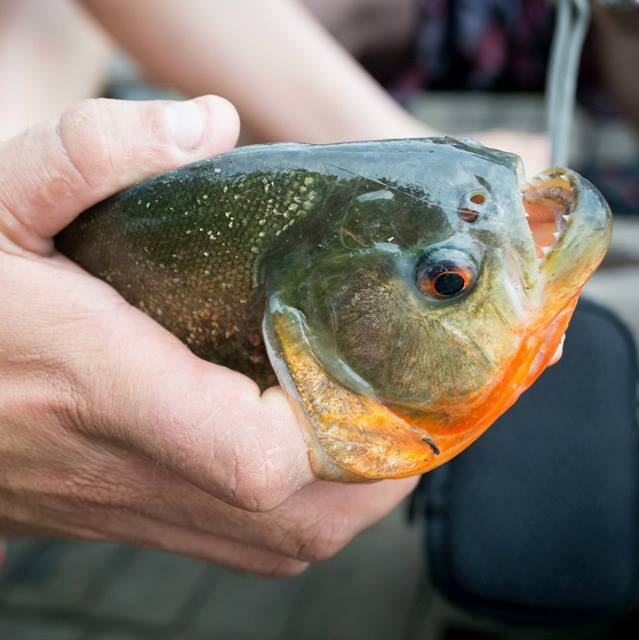 Welcome to the Amazon – we are eating flame-grilled Piranha tonight for dinner! 1. We took our tour from Manaus, Brazil, a large city surrounded by Amazon rainforest that offers many different tour experiences. Our tour was a three day, two night experience that included trekking and fishing and all meals included. On the first night we slept in the bamboo hut and on the second night we slept in a hammock in the jungle. 2. Of course, you can also access the Amazon from other regions such as in Peru. 3. Make sure that you bring closed toe hiking shoes (women, men) with good grip and strong ankle support. 4. Don’t forget the bug spray, the Amazon is filled with mosquitos and other insects that want to bite you! Also, bring long pants (women, men) and long sleeved shirts (women, men) to protect your arms and legs from bites. 5. I would also recommend a flashlight (headlamp or torch). There are no street lamps to illuminate your camp, so once the sun sets everything will be very dark. 6. Don’t forget a good binocular to spot some birds on the way. 7. Of course, you will want to take along your camera with a good lens and an extra memory card so that you can capture the experience. 8. Take your swimsuit too! I loved swimming in the river because it was cool and refreshing in the sweltering heat. 9. Bring plenty of water with you, the Amazon is boiling hot and it’s important to stay hydrated. Taking a trip into the Amazon region certainly pushed me beyond my comfort zone. Once I had conquered the challenge of fishing for Piranhas, one of the greatest Amazonian adventures, I was prepared to hold a live caiman in my hands, eat maggots or sleep overnight in a hammock in the deep jungle. This part of the world is a little wilder than you might be used to, which really is a good thing.